XCStats Cross Country includes the features you need to motivate your team, painlessly provide complete individual and team statistics and communicate with your team community all while saving you time! Read and view the features of XCStats Cross Country then check out our special offer for new subscribers. Click on the slide or the numbers to advance. Our PR's and improvement calculations are based on the actual course, not just distance like track-based systems. We also keep historical top-7 team times. We're the only application in the market that does this, so if you want accurate cross country stats, we're it!. The challenge with any database is loading the data. Guess what? You don't do it. We do. You just enter your schedule and we do the rest! Every coach wants to measure their athletes by their improvements. The problem is that it's difficult in cross country so coaches often miss the opportunity to reward their kids. You'll never miss recognizing an improvement with XCStats. XCStats includes 25 reports and charts! All cross country team and individual statistics are included, both all-time and individual meets. Get comparison charts, rank athletes and measure improvements. And TONS more! XCStats can be your complete web site, allowing you to publish pages from Google Docs, MS SkyDrive, YouTube & photo galleries. You can add sign-up sheets for volunteers & calendar views of workouts. Follow Selected Athletes - For subscribing coaches, athletes and parents only - pick any athlete from our massive database and follow them all season. Compare Careers Chart - Overlay the careers of selected runners on a chart. To see example go to above report and select runners. Compare Career Course History - Overlay the careers of selected runners on a given course. For an example, go to above report and select runners for chart. Search Individual California XC Results - Search our massive database of nearly 1,000,000 individual results. Also available with the XCStats Guest Pass. Search Team California XC Results - Search our database of over 100,000 team results. Also available with the XCStats Guest Pass. Pop-Up PR Report - Instantly see PR's from any meet. Click on the PR number from any meet. Race Preparation Report - For subscribing coaches only, a history of all current runners on an upcoming course. Training Logs Analyzer - For subscribing coaches and runners, a report and chart to evaluate training log data and compare between runners. Another Improvement Report - For coaches only, this one shows season-over-season and course-over-course improvements. Good for the end of season banquet! Goal Setting System - Runners examine past results on upcoming courses to set goals and enter pre- and post-race comments. Can also enter season goals. Coaches review goals, send emails to runners to comment on their goal and perform what-if analysis. Training Log System - A complete system for capturing and analyzing training information. Email System - XCStats collects runners and parents email addresses during the registration process. Then coaches can send emails to runners and parents directly from XCStats. Post-Race Emails - With a few clicks after a race, coaches can send personalized congratulatory emails to their runners, with a copy to his/her parents. Text Messaging - When email is just not fast enough! Send bulk text messages to parents and runners directly from an XCStats web page. No need to collect or type in phone numbers - XCStats handles that during the registration process. Communications Preferences - Parents and athletes can specify their desired method of electronic communication from the coach, text messages or email. In the team discussion forum, they can choose to automatically receive all, some or no postings. For instant notification of race results, runners and parents can subscribe to receive alerts. Team and Task Management System - A comprehensive system which allows coaches to define team administrative tasks, such as the return of forms or money, and then track the runner's completion of those tasks. Other tasks include goal setting and entering training log data. Publish Web Pages - Use XCStats as you team web site! Publish any web page to your schools' INTERACTIVE page. This can include any Google Docs or Microsoft SkyDrive page, a YouTube video, photo galleries and more. Pages are automatically archived when they are out of date. See an example on this page. Follow Any Athlete - Select a group of athletes to follow this season. Use this interactive tool to search for athletes and then save your searches so you can compare athletes to one another. Isolate their performances on similar courses. Share Link Tool - Runners and parents can add links to your XCStats site to share information such as photos, articles and videos. Discussion Forum - A private forum for runners, coaches and parents to share experiences, plan logisitics. Course Time Converter - Convert times from one course to another. Report. Runner Name Spelling-fix Tool - For coaches to clean up inconsistent names. Parents and Runner Email Form - Parents and runners can send emails to the coach directly from XCStats. Learn why XCStats has been adopted by over 100 high schools. Click on the additional section headings below to explore the benefits of using XCStats for cross country! Then check out our pricing page for special promotions. With XCStats Cross Country, you get 25 reports and graphs! The individual reports include 9 different peformance metrics, the most important being those related to improvement. XCStats calculates true PR's and improvements for every course, unlike track-based databases which only consider distance. And, since cross country is a team sport, all team statistics are computed for both all-time and individual meets. Our statistics highlight improvement over speed so that every runner on the team can succeed, not just those who count in the scoring. Team and individual improvements are calculated in many ways: by comparing the performance against their personal record, against their last race on that course and against their time from a year ago, if available. And every runner participates on a team since the statistics are computed for all groups of 5, not just the first 5. Recognizing runners for their accomplishments creates an attitude of success which motivates future training and commitment. Our statistics show that, on average, about 70% of your runners will improve every race. If, as a coach, you're not recognizing those runners, then you're missing an opportunity to motivate your team and build spirit. With XCStats Cross Country, you'll never miss an improvement, either team or individual. Communication is the backbone for an organizations' success and a high school cross country team is no exception. With large team sizes, reduced school funding and busy coaching staffs' easy, rapid and effective communication is essential. To meet this need, XCStats Cross Country includes a complete email system, text messaging, a team-only discussion forum for two-way communications, file upload for document distribution and unlimited web page publishing. XCStats can be your team web site! XCStats makes sending emails and text messages easy. The system collects parent and runner email addresses and cell phone numbers during registration so coaches don't need to transcribe (and mis-type) addresses. Email and text messages are sent one-at-a-time so addresses are not distributed without permission. And parents and runners can even send emails to the coach from XCStats. 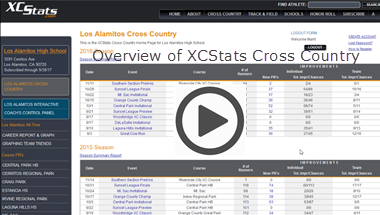 Coaches can publish any web page to their XCStats site enabling XCStats to be their full web site. Pages can be published from Google Docs, Microsoft SkyDrive, YouTube, photo galleries and more. Pages are automatically archived with they are out of date. Research shows that the fastest, most effective way to improve performance is to set a goal, yet very few coaches have implemented a goal setting procedure broadly and consistently. Why? Because with large team sizes and many events, it's a paperwork nightmare! XCStats Cross Country includes a goal-setting system so runners can set goals, and coaches can review them, in seconds. And with a few mouse clicks, coaches can send an email to runners (and optionally with a copy to the parents) to those who haven't yet set their goal. Many coaches like to monitor the training of their top runners, whether a summer running program or mid-season workouts. XCStats includes a training logs recording and charting tool so runners can easily enter their workouts, coaches can review them and both can chart their cumulative or weekly mileage. It even includes a year-over-year option so runners and coaches can compare their training against previous seasons. A recent survey revealed that coaches spend less than half their available time actually coaching! Most of the time is spent entering data or calculating statistics, communicating with parents and runners or managing the team. XCStats puts a major dent in the time required for those tasks! Time spent on collecting, entering and computing statistics becomes virtually zero; the built-in email system and web site greatly streamlines communication and the coaching tools allow you to implement performance-improving processes without consuming much time. XCStats also includes Team Management features where coaches can assign, monitor and communicate information about athlete tasks, such as paying fees, returning forms or checking in/out uniforms. A coach can quickly determine who has not completed the task and send a reminder to the entire group with a few mouse clicks, including to the parents of deliquent athletes. Take attendance with XCStats! Use your mobile device to quickly and easily record attendance and absences, create summary reports and send email notices to kids and parents. No more taking attendance on paper! Special Pricing for New Subscribers! As a new subscriber, you can try XCStats Cross Country all season long for nearly nothing! You'll get full functionality: 25 reports and charts, complete individual and team statistics, the email system, goal setting, training logs, web site, discussion forum and team management tools - the WORKS! Plus, we even load your previous seasons data! Go to our interest form to check out the special pricing for new subscribers.